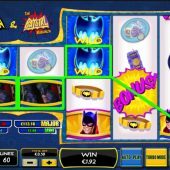 Batman and The Batgirl Bonanza slot is the forth in the DC Comics Batman series available via the Playtech platform, joining Joker Jewels, Catwoman Cash and The Riddler Riches. The game has clearly been based upon WMS's Bruce Lee game, with a 22444 reels format and the same 60 paylines. In other words reels 1 and 2 have 2 rows only (each of the 4 positions is a single reel) and reels 3, 4 and 5 have 4 rows. Surely this slot is missing The Joker! Two's company, three's a crowd? There are stacked Wilds on all reels and stacked symbols of the premium 3 characters of Batman, Batgirl and Robin who also appear in 'co op' form in other words any pair of the 3 together in stacked form too which can count as either character. The best 5-of-a-kind win is the Wild paying 66.67x stake and then Batman at 13.33x stake right down to the lowest picture at 1.33x stake. 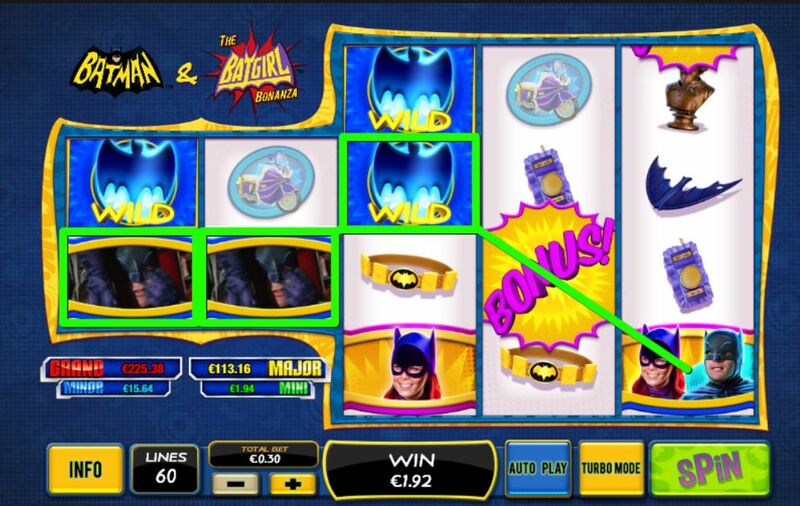 There is the 4-tier random jackpot available too on Batman and The Batgirl Bonanza slot. Should you land 3 yellow bonus scatters on reels 3, 4 and 5 then you are awarded a pick feature which will either award you 12, 17 or 25 free games. In all these free games a single block symbol will land to fill the 2x2 section, different each spin . Again, need some decent matches or stacked Wilds on the bigger reels 3, 4 and 5 to accumulate wins. No retriggers in either bonus round. Batman and The Batgirl Bonanza slot is decent to play and the 5 Batgirl Locked Respins occur very frequently. This because the developer of this game, Ash Gaming have simply 'borrowed' the winning formula from WMS and Bruce Lee slot. The only difference is that you don't get the 20 spins for landing both bonuses at once. So it's basically a far less volatile version which might appeal to some players, who prefer high frequency smaller wins. The RTP is 96.0% of which 0.99% pays in to the progressives. Medium-sized wins are frequent and it does have potential for big hits. The sound effects ground me down a bit though after a while. Next time I see the Bat call in the sky I might just have to ignore it.